We’ve started a new initiative where we will be profiling two places, two people and two charities that are involved in the local ski/board community. We want to shed some light on the amazing snow culture we have here in Edmonton, and we want your help. If you know someone, or know of a place that deserves some recognition, send us an e-mail with the subject line “Our Amazing Edmonton” and some information and we’ll take them into consideration. 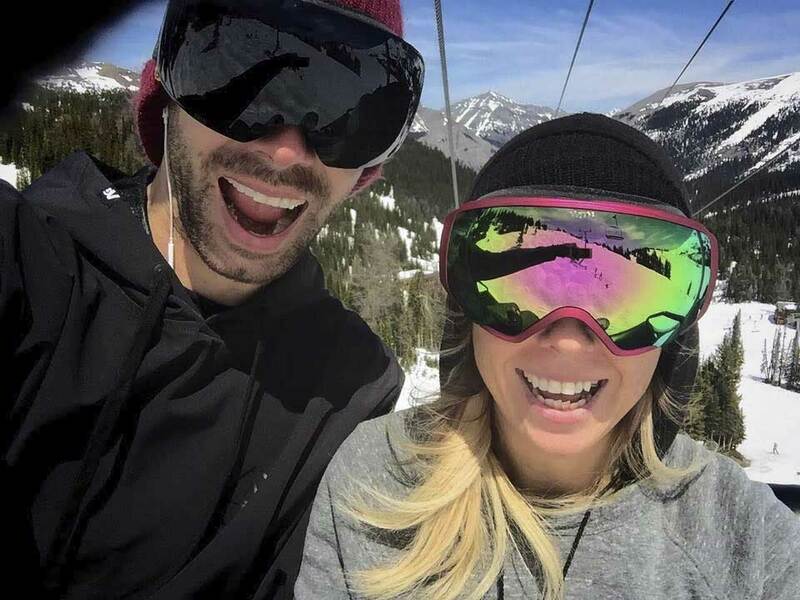 Matty and Kyla are a rockin’ snowboarding couple who are long-time friends of the Edmonton Ski & Snowboard Show. Matty has been working with us as a big part of our planning team on the Rail Jam since the year after its inception, and is always working the crowd with his infectious energy! Kyla works with Burton, spreading her passion for snow. How long have you been into skiing/snowboarding? What is your all-time favourite skiing/snowboarding moment? Matty: Going to Baldface in 2014. Kyla: The first time I hit a jump in the park. What is it that makes the skiing and snowboarding community here in Alberta so awesome to you, personally speaking? Matty: Friendships and the level of respect and fun we all share. Kyla: Everyone loves to band together socially – it’s a very welcoming community. It’s a brotherhood/sisterhood. Everyone has common ground on some level. Which ski/snowboard hill is one that you will always go back to? Matty: Front side 7 off the toes, and back one. Kyla: Butter-back one or backside 180. Tell me a bit extra about yourself. Matty: I am an open book. I’m a registered nurse and I have 5 dogs! Kyla: I’m self-taught – I was too intimidated so I taught myself at Canada Olympic Park in the evenings. Jim Hillman is a lifelong ski & snowboard lover, working in the industry since he was only 16 years old. His passion for these snow sports has lead him to his ownership of Sundance Ski Shop, a skiing and snowboarding shop with passion for knowledge, expertise, and an exceptional shopping experience. Sundance Ski Shop has just moved to their new, bigger location on Gateway Blvd.! Edmonton – I moved here when I was 10, and this is my home. Skiing for 37 years, snowboarding for 24. Waking up in Valemont to see a metre and a half of snow. Everyone can do it; it’s a social sport, but you always set personal goals for yourself that are shared with friends and family. Marmot (my home hill), but I will basically go where the snow is – I will drive a long way for great snow. I do a lot of back country, all over the place. Not so much into tricks anymore – note the 37 years of skiing! I enjoy dropping cliffs. No big air stuff. Aside from my passion for skiing, working in the industry since I was 16 has been my life. Paul Burgess is the owner of Mud, Sweat & Gears, a family owned and operated bike, snowboard & ski shop. They have two locations, one in Sherwood Park and one in Spruce Grove. Mud, Sweat & Gears began when Paul’s basement was over-run with bikes from his booming out-of-home bicycle repair business. In December of 2006, Paul and his wife took the plunge and opened the original Sherwood Park location! How long have you been into snowboarding? What is your all-time favourite snowboarding moment? 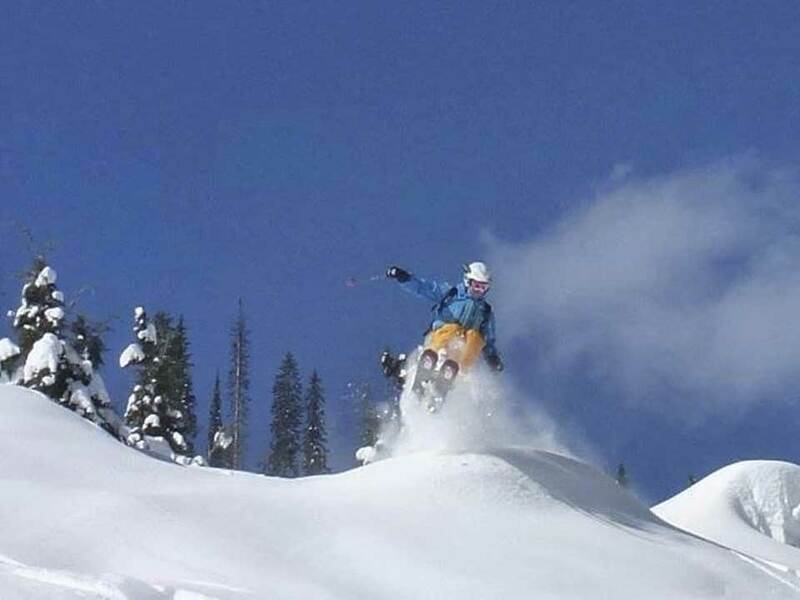 When I was snowed in at Revy – we were locked in, just had to be at the hill. Seeing families out together, away from the pull of society. It’s a good thing to be doing with friends and family. So far, what has been the “best moment ever” for your shop within the ski/snowboard industry? The first year we did the Edmonton Ski & Snowboard Show, we had no idea what we were doing and we got slammed. A close second would be becoming a Burton dealer – it’s a great brands for outdoor enthusiasts. What sets your shop apart from the others? The staff. They’re fantastic. They have become like a family, doing fun things after work. They make working fun for me. Trying to grow and streamline business to be very competitive – compete globally with pricing on a local level while bringing in service. There you have it folks. If you’re ever in the Sherwood Park or Spruce Grove area, head over to Mud, Sweat & Gears and say hello! Sunshine Village sits high on the Continental Divide in the heart of Banff National Park, yet just 15 minutes’ drive from the cozy mountain town of Banff. Three sprawling mountains provide breathtaking sitelines, uninterrupted by any signs of civilization beyond the resort’s leasehold. It is possible to ski in two provinces – Alberta and British Columbia – in one run. Sunshine Village’s seven-month season stretches from early November until late May – the longest non-glacial season in Canada. Sunshine can receive up to nine metres (30 feet) of snow in a season, and it stays all year. The resort is nestled in the mountains located in the heart of Alberta – and in our hearts, too. The resort also features 12 lifts, including nine superlifts, Canada’s only heated lift, and a high-speed gondola. For this interview, Lindsay Gallagher (Media & Marketing Director) will be giving us the scoop on Sunshine Village. Cochrane, AB – I grew up in Sunshine! How long have you been into skiing? We always had a family pass to Sunshine Village growing up; I’ve been skiing since age 8. What is your all-time favourite skiing moment? Last year was the first time I hiked into Delirium Dive and looked at the views. They were spectacular. Moments like those are why I do what I do! It’s the sense of community. It’s not skiiers vs. snowboarders; everyone is just there taking in the views. Everyone who is passionate about the sport has that in common. It brings us all together. What is it that makes Sunshine Village such a great place for skiing/snowboarding? The unique part of Sunshine Village is that even when there are lineups, once you get up to Village it never feels crazy busy. Everyone has their favourite places. You feel like you’ve got the whole mountain to yourself. What has been your greatest ‘success story’ as an organization so far? This year we have a new TeePee Town LX chair – the first heated lift in Canada! The last few years, we’ve made an investment in guest experience. Snow hosts handing out hot chocolate in line, stuff like that – we have a commitment at Sunshine Village to push the envelope and offer guests the best possible experience! Located in the breathtaking Jasper National Park in the Canadian Rocky Mountains, Marmot Basin is a ski and snowboard destination that inspires lasting memories. Only 20 minutes from the town of Jasper, Marmot Basin offers 3,000 vertical feet of superb skiing and snowboarding on 1,675 acres of varied terrain. Large, snow filled bowls are paradise for powder skiers and snowboarders. For those who enjoy cruising, their state of the art grooming fleet keeps the tree-lined trails groomed to perfection. For this interview, we will be getting the latest on Marmot Basin from Brian Rhodes. Edmonton. I’ve lived in Jasper since 1978. Skiing for 42 years, snowboarding for 25 years. In my young teenage years, I visited Marmot Basin from Edmonton. It was my first taste of powder skiing through the trees – deep, fluffy snow. The enthusiasm and passion that snow riders have for the sport. We all have one common passion and interest that bring everyone together! Diverse backgrounds and interests, passion for skiing and snowboarding, we’re all singing from the same songbook. 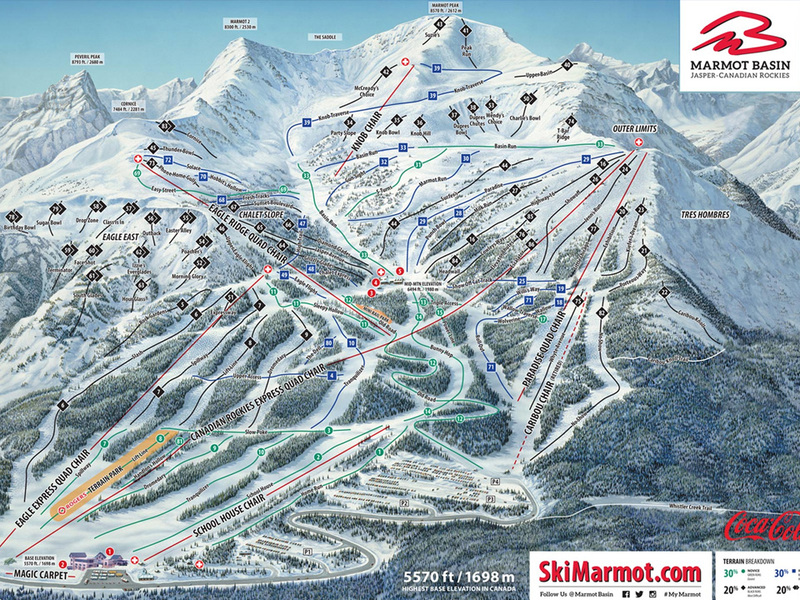 What is it that makes Marmot Basin such a great place for skiing/snowboarding? Three things; one, the diversity and variety of terrain – regardless of ability, there’s something for everyone! Two, the quality snow – once we’re open, you’re able to ski. 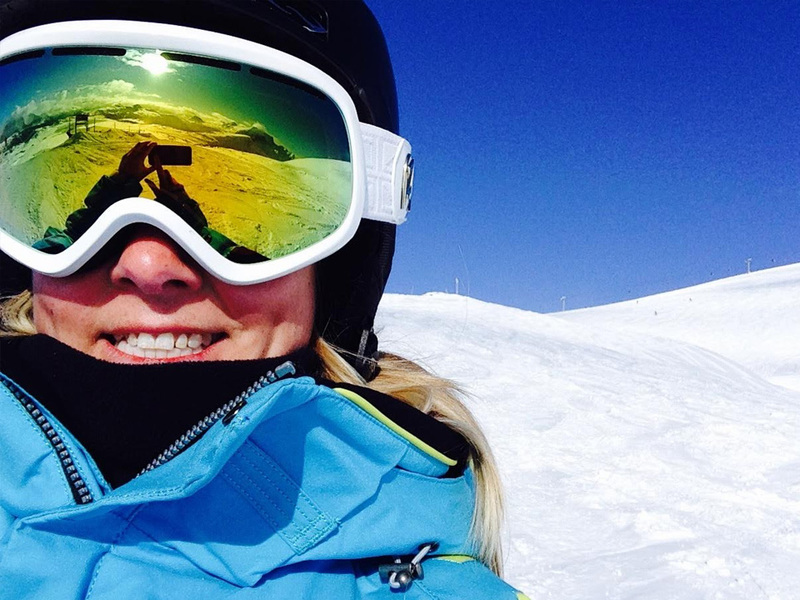 If you book a ski holiday, you will ski. You will never get rained out. Three, uncrowded nature!! We have so many success stories – our biggest success can’t be summarized in one incident – but the way Marmot Basin has consistently improved our product for the last decade is part of it, we have invested over 30 million dollars since 2003, including 3 lifts and a snowmaker in the face of economic downturn. Invest, invest, invest – it has been a huge success. We got a recent approval this summer for our first long-term plon, approved by Parks Canada. We are moving forward with a lot of the projects identified in our plan: improvements to parking, renovations to base chalet, glading of ski runs and snowmaking. After the snowboarding community lost long time rider Nathan Syska in 2012, Ewa Jastrzebski and Roman Hermens set out to create a progression camp in memory of Nate’s love of riding. Ewa now the Director and Roman the Head Coach of SYSKA Shred Camp, a snowboarding camp that teaches all levels of riders how to progress and refine their park skills in a safe and unintimidating environment. SYSKA Shred Camp is a non-for profit snowboard camp. Every year we partner with a new local AB organization and donate to them 100% of our proceeds to further their support of the community. Roman: umm – Not 100% sure, about 16 years. Ewa: The year Revelstoke opened – so much snow! Roman: Also a tough question, i guess every time I land something new or fun. Kicking up some pow is an unparallelable feeling as well. Roman: The scene here in Alberta is pretty great, no drama and everyone encourages and supports one another. What is the goal/mission of your charity? Ewa: Good times, good fun, lots of smiles, laughs and memories made with friends, all while progressing and refining your riding skills – what snowboarding is all about! Roman: SYSKA Shredcamp is about planting the seed. The seed being that intangible goodness that comes from being a part of this amazing thing, this community of boarders. It’s more than that, It boils down the the positive effects that snowboarding has had on all our lives. What has been your greatest “success story” as an organization so far? Ewa: We are entering our 3rd year and hearing campers say “this was awesome, we can’t wait to be back next year” “I was nervous at first, but now can totally hit the jump” is exactly the excitement and confidence we want to built. With the support of the industry and friends we can continue to grow and inspire a new generation of kids on the hill. Roman: Definitley what Ewa said. Its all about the campers, making sure they leave really pumped, and then turning around and using the proceeds to donate to someone who needs it. It’s good on top of good on top of good. Ewa: This year we are partnering with YESS (Youth Empowerment & Support Services) and our goal is to raise $3,500-. We are proud to have worked with The Support Network and The Stollery Children’s Hospital in past years with a combined total of $2,700 being donated to date. Every year our camp is run at Snow Valley Ski Club in Edmonton and in the future I’d like to add another weekend of camp and take it to one of the mountain resorts in Jasper or Banff. Roman: The more the merrier. We’d like to keep expanding and for sure head to a larger resort, maybe run more than one camp per season. Having more participants will be great as well. We encourage anyone, regardless of age, to sign up. We teach terrain park skills, but that translates to more fun outside of the park when you’re out cruising with your friends.